Upcoming Lecture - "Jihadists in our Midst"
What: Jihadists in our Midst: The Battle Against Islamism in the US, Lecture by Reed D. Rubenstein, Esquire, attorney for Andrew Whitehead of Anti-CAIR. Please come and join Reed Rubinstein, the attorney who defended Andrew Whitehead in the defamation lawsuit suit filed against him by CAIR. There is no charge to attend this important program. Seating is limited, Please RSVP to Seth Harlan at SHarlan@rjchq.org or 202-638-2909 x 107. This lecture is sponsored by the Republican Coalition, New England chapter. I attended a lecture earlier this month at Merrimack College. The speaker was Dr. David Gordis, president of Hebrew College, who spoke about "Jews, Christians and Muslims: Building Bridges." Dr. Gordis is also affiliated with the Interreligious Center for Public Life (ICPL). In response to a question about the ICPL, Gordis discussed the Islamic society of Boston (ISB) lawsuit. He said that the "both sides had legitimate concerns," citing ISB's claim that they faced religious discrimination, and The David Project's (TDP) concern about radicalism in the ISB leadership. Dr. Gordis stated that the ICPL was able to get "both sides of the ISB lawsuit to sit down and talk to each." He noted that after the ICPL intervened, the lawsuits were dropped (in May 2007), inferring that this was a result of the ICPL's mediation. As a close observer of the ISB lawsuit, this is poppycock. 1) There weren't two sides to this lawsuit, there were 18 sides: the ISB on one side, and the 17 people,organizations and media outlets that the ISB sued. This lawsuit was never just the ISB vs. TDP. "In the months before the ISB decided to abandon its claims against us, the discovery process – often the worst part of a protracted civil litigation – was uncovering even more disturbing facts about the ISB than we had previously known: multiple out-of-state bank accounts; millions of dollars in subsidies from Saudi Arabia; a close connection to imprisoned terrorist Abdurhaman Alamoudi and Muslim Brotherhood “spiritual director” Yusef Quaradawi; donations to the Holy Land Foundation; and more. We had said that the ISB’s leaders were not the moderate Muslims they were pretending to be. The discovery process was proving that we were more right than we knew. " The trustees of the ISB now are the more or less the same people as before, and they include Sheikh Yusuf Al-Qaradawi (still a proposed trustee, although banned from entering the U.S.) and Dr. Walid Fitaihi (whom even the Boston Globe thought should resign). In addition, the latest trustee, Dr. Jamal Badawi, is an open supporter of the Muslim Brotherhood. The day after the lawsuit was withdrawn by the ISB, the Muslim American Society (MAS) held a press conference, confirming that the MAS is running the show now. 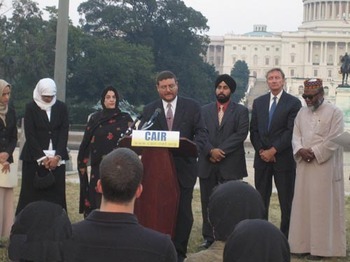 The MAS is the American branch of the Muslim Brotherhood. The "legitimate concerns" about the ISB leadership haven't gone anywhere. The ICPL had nothing to do with the withdrawal of the "legal jihad" lawsuit by the ISB. The ISB could see the information coming out was damaging and they weren't going to win. It can't be defamation if it's true. "An effort by radical Islamists to smear terrorism expert Steven Emerson backfired last week when the allegations proved to be fabricated. An article entitled, “Paul Kendall: Did an 'Expert' on Terrorism Conspire With a Foreign Government to Violate the Constitutional Rights of American Muslims?" was posted on PR Newswire on March 4. It was based on copies of emails the author claimed to have reviewed. 'These electronic communications prove that Steve Emerson, along with some anti-Muslim advocacy groups, worked directly with the public affairs office of the Israeli consulate in Boston to formulate the creation of a smear campaign intended to stop the construction of a new Islamic cultural center,' the article claimed. "PR Newswire sought to corroborate the article’s claims. But the emails say no such thing - out of dozens posted with the article, Steve Emerson is referenced in only two. In neither case is he shown in any communication with the Israeli consulate, communication which simply did not happen. The author of the article apparently did not respond to requests from PR Newswire for corroboration." Flying Imams Case Going to Jury Trial? "US Airways and Minneapolis airport officials are demanding a jury trial in a civil rights lawsuit filed by a group of Muslim imams who were removed from a flight for suspicious behavior." "The airline and Metropolitan Airports Commission (MAC), which oversees Minneapolis-St. Paul International Airport, are also claiming immunity for their employees named in the suit, citing a 'John Doe' law passed by Congress last year that, among other things, protects people acting in an official capacity to prevent terrorist attacks." "Frederick Goetz, the imams' lawyer, declined to comment on the lawsuit, which was amended Dec. 14 and now names six airport police officers as defendants. The suit says the officials engaged in 'intentional discrimination' when they removed the imams from the Minneapolis-to-Phoenix flight in November 2006.' "
"In its Dec. 20 response, the commission said: 'MAC police officers took reasonable action in good faith upon reports of suspicious behavior.' US Airways filed its response Dec. 26 in the U.S. District Court of Minnesota and denied more than 200 complaints levied by the imams." Talk about a setup and backers with lots of money. What a shame that our airports have to spend their resources protecting themselves against this litigation jihad. But I'm glad that US Airways and the MAC are taking them on. You can read the Flying Imam's second amended complaint here: There's lots of verbage about "well-respected, religious leaders" feeling "degradation, humiliation, shame, despair, anguish, damage to their reputations." Not a peep about the anxiety they caused to the passengers of the plane. Naturally, the Flying Imams claim that they "endured and continue to endure economic losses." If you have access to PACER, this is Civil Action No. 0:07-CV-01513, in the Minnesota federal court. Doug at Crossword Bebop has done the hard work of comparing and analyzing the (second amended) complaint and the defendants' responses. His summary of U.S. Airway's response: "Oh yeah? Prove it!" Here's his collection of Flying Imam blogposts. "There seems to be relatively little in dispute between U. S. Airways and the imams with regards to the facts, but there is quite a bit of dispute with regard to the significance of the facts." Fighting Back Against "Strategic Litigation Against Public Participation"
Great article at City Journal by Judy Miller about the recent successes for people sued by Islamists. Naturally, the Islamic Society of Boston lawsuit is prominently featured in the article. "Over the last few years, Islamists have tried silencing reporters, scholars, and citizens by suing them for defamation, often successfully. But recent legal cases in California, Massachusetts, and Minnesota suggest that the tactic may finally be backfiring, at least in the United States, if not in Britain, where libel laws overwhelmingly favor plaintiffs. The American lawsuits’ outcomes—poorly covered by the media—represent victories for the free expression and public participation that the First Amendment guarantees." Twenty states have enacted anti-SLAPP laws, including Massachusetts. “SLAPP” stands for "strategic litigation against public participation." These lawsuits aren't really intended or expected to win in court, they're aimed at "intimidating into silence a group or a publication raising issues of public concern." "Last May, the Islamic Society of Boston dropped its suit against the Boston Herald, a local Fox news channel, journalist Steven Emerson, and 14 others. The Society had accused the defendants of libel and of infringing its civil rights by claiming that it had funded terrorist organizations, received money from Saudi Arabia, and bought land for a mosque below market value from the City of Boston." Hah! How can it be libel if it's true? "Though Massachusetts’s anti-SLAPP law does not cover media firms, ten of the non-media defendants filed a motion to quash the Society’s suit. When a state judge rejected the motion, a legal discovery process got under way while the defendants appealed. Bank records and other documents revealed that, contrary to its claims, the Society had raised over $7 million from Saudi and other Middle Eastern sources and had funded two groups that the Bush administration has designated terrorist entities: the Holy Land Foundation for Relief and Development and the Benevolence International Foundation. Records also showed that Society directors had deleted all e-mails about the Society’s land purchase. Finally, discovery revealed that the deputy director of the Boston city agency in charge of negotiating the land deal not only was a Society member whom it had paid to raise money in the Middle East, but also secretly advised the group about obtaining the land cheaply—a clear conflict of interest." Certainly looks that way to me. The gentleman Miller is referring to here is Muhammed Ali-Salaam, deputy director of the Boston Redevlopment Authority (BRA), whom I've written about earlier here and here. As one of my commenters wrote, the extent of "help" that Ali-Salaam gave to the ISB - to the detriment of the BRA getting anything remotely approaching fair market value for the property - appears to be criminal. We have state laws against this sort of thing. As far as I know, no City officials have asked tough questions of the BRA or the ISB, except for City Councilor Gerry McDermott, who is approaching the end of his term (he did not seek re-election). My earlier blog post lists some of the incriminating documents that were obtained through the discovery process. BTW, it's been reported to me that during the ISB lawsuit, one of the ISB's leaders ordered one of its new staff to remove some 20 cartons of records from the ISB office and take the cartons to that person's home. One wonders if this has been investigated and corroborated. One wonders what ISB records we haven't seen, and may never see. "On May 29, soon after the state appellate court heard arguments on the anti-SLAPP appeal, the Society abandoned the suit. Though its lawyers did not respond to requests for comment and its website tried to put a good face on the surrender, Jeff Robbins, who represented several defendants in the complex lawsuit, expressed their belief that the Society had caved, fearing the prospect of paying what could have been millions of dollars in court and legal fees. “The anti-SLAPP motion clearly played a role,” said Robbins, who represented two clients for free because First Amendment issues were involved. Another factor, he said, was the Society’s fear that the court would order it to answer questions under oath and release information that it had tried to keep secret, such as the names of its donors." Although the ISB withdrew its lawsuit, the ISB and MAS claim that they achieved a victory, both at a press conference, in their 2006/2007 annual report, and in recent lectures held at an area mosque. I guess it was a victory for the ISB/MAS. The hemorraghing of damning evidence about the ISB came to a halt. Anyway, please read the whole thing, Miller's written an excellent article about the recent blowblack to the Islamists who are engaged in a legal jihad to try to silence their critics. May the blowback continue! And stay tuned, because The David Project (one of the 17 defendants in the ISB alwsuit) is still enaged in a lawsuit with the BRA, seeking to obtain records about the BRA's real estate deal with the ISB, particularly Muhammed Ali-Salaam's involvement. An employee of a public agency traveled overseas to the Middle East to raise funds for this mosque. The public deserves to know every last detail about that sort of thing. I'll let you know about this ongoing litigation as soon as I hear anything.